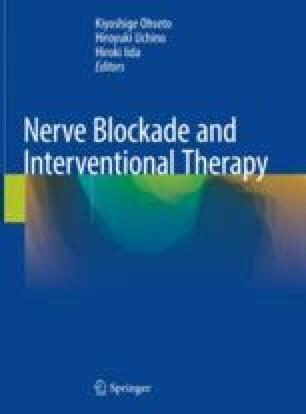 The nerve block for abdominal visceral pain, which is a compartment block, can be more safely performed using the guidance of IVR-CT and other CT modalities that permit observation of the anatomical association with the position of the needle tip and spread of contrast media than using the previously used fluoroscopy-guided method. The transdiscal technique is considered to have important advantages over the paravertebral technique: (1) it can be completed in a single procedure of block needle insertion and withdrawal, whereas the procedure must be performed once on the left and again on the right in the paravertebral technique; and (2) the amount of drug injected is smaller. Performance of the procedure under fluoroscopy is more convenient than under CT guidance, and real-time observation of the lateral, vertical, and anteroposterior spread of the contrast medium and any entry into blood vessels can be readily performed. For the CT-guided procedure, the use of an IVR-CT as the CT system is preferable, if available.